Tidal wetlands and the ecosystem services they provide are under siege by a number of interacting anthropogenic global change factors. However, we have largely overlooked one global change factor with the potential to be a “game changer” with respect to future tidal wetlands: invasive species. Since the 1960s, a non-native lineage of the common reed, Phragmites australis (commonly called Phragmites), has been taking over wetlands across North America. While Phragmites has both a native North American lineage and a non-native Eurasian lineage, it is the introduced lineage that is particularly invasive in North America. Invasive Phragmites grows in dense clusters up to 15 feet tall, changing both the structure and function of wetlands. As it becomes an ever-more dominant wetland species, understanding its response to global change is critical. This third experiment was established to forecast how invasion rates of introduced Phragmites australis will respond to two fundamental global change factors—elevated carbon dioxide and nitrogen pollution—and how this will be affected by genetic diversity. We expect our research to generate clear insights about how Phragmites invasion will respond to global change (CO2 and N), the costs and benefits of such invasions in terms of ecosystem services (e.g. elevation gain and nutrient removal), and how Phragmites invasion will proceed in a realistic, near-future estuarine environment. In 2011, the scientists in SERC's Global Change Research Wetland (G-CREW) set up 12 open-top chambers on the border of a Phragmites invasion front. They built the chambers so that one-third of each chamber enclosed the encroaching Phragmites stand into the native marsh. 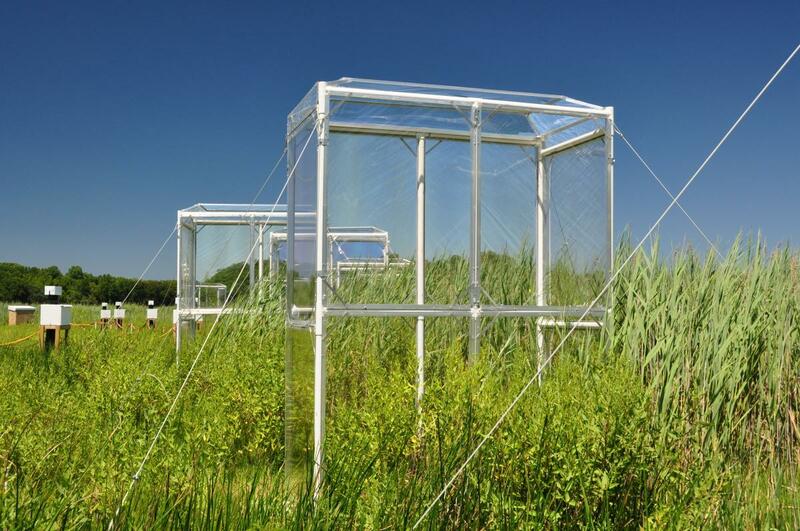 This set up allowed them to track not only Phragmites' response to global change, but the rate of its invasion across the marsh. Similar to the carbon dioxide and nitrogen experiment, each plot also contained deep-rod soil elevation tables, allowing for sensitive measurement of elevation change in each plot. Unlike the first carbon dioxide and nitrogen experiment, in which increased carbon dioxide favored one native plant and increased nitrogen favored another, we have found that introduced Phragmites responded strongly to both carbon dioxide and nitrogen. A modeling effort of gross primary productivity (GPP) created from empirically collected data demonstrated that under current and near-future conditions, monocultures of Phragmites will have at least double the GPP of the native marsh under any current or near-future global chance scenario. As a consequence of the increased productivity, the data also suggest that Phragmites builds soil elevation very quickly, making it a strong contender for surviving future climate change and potentially helping the wetland keep pace with sea-level rise more than the native plant community. While global change factors independently and significantly increased invasion rate, our data show signs of signs of biotic resistance against invasion by forb community under the combined treatment of CO2+N. We need long term-data to evaluate this hypothesis of biotic resistance with global change. Additionally, we have evidence of genetic filtering with each global change treatment, and we aim to evaluate the effects of Phragmites genetic filtering on biogeochemical cycling. Finally, as Phragmites takes over the chambers, we will be able to evaluate how Phragmites-dominated marshes will function in the near future with respect to relative sea level rise. Phragmites australis in large chambers to manipulate CO2 and nitrogen (photo credit: Tom Mozdzer). Elevated CO2 and nitrogen can also affect the growth, spread, and effects of Phragmites patches by changing their genetic diversity and composition. We have found that both elevated CO2 and elevated nitrogen increased the rate of Phragmites invasion into the native marsh. Some genotypes grew more when nitrogen was increased, others grew well when CO2 was increased, but no particular genotypes outgrew others when both CO2 and nitrogen were increased. This suggested that patches of Phragmites that are more genetically diverse have a greater chance of having some genotypes that are particularly well suited to grow in any environmental conditions.